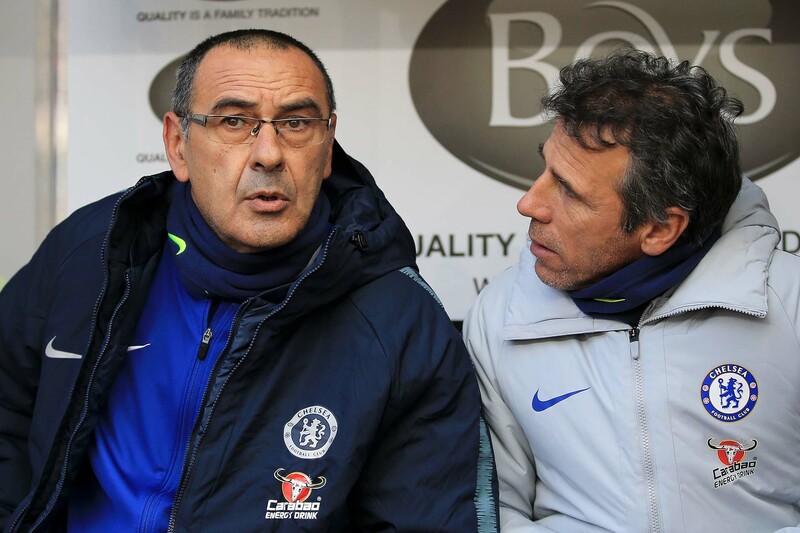 Maurizio Sarri speaks with Gianfranco Zola prior to the Premier League match between Burnley FC and Chelsea FC at Turf Moor on October 28, 2018 in Burnley. A very weary Chelsea side fell to Spurs at Wembley Stadium, Giroud scoring the only goal for the Blues in their first loss of the Premier League this season. The game proved to be a stark contrast to the same fixture last year where a heroic Marcos Alonso helped the Blues to a brilliant 1-2 win. Chelsea started todays game with a very familiar line-up from the game against Everton. Kepa, Azpilicueta, Rudiger, Luiz and Alonso started with Kovacic, Jorginho and Kante in midfield. Eden Hazard started on the left side of attack with Morata the sole striker and Willian to the right side. From kick-off, Spurs piled on the pressure as two corners came to the hosts within the first minutes. The first was cleared away by Chelsea, however Dier headed just over for Tottenham. You could see immediately this Chelsea side needed to keep some sort of foothold in the game from the first minutes, to calm it down and quieten the home crowd. This assurance was nowhere to be seen. Alli came close to getting a touch past Kepa in the third minute and then Kane put a header straight at Chelsea’s keeper in the 4th minute. Surely the alarm bells were starting to ring now for the Blues. In the 7th minute Luiz fouled Harry Kane for a Spurs free kick in a good position just right of Chelsea’s penalty area. It was certainly an area where Eriksen could exploit with his dangerous set piece taking. Eriksen delivered the cross with fearsome whip, where it looked like it was heading towards Kepa. Unfortunately for the Spaniard, Alli judged the cross well and flicked it with his head just putting off the keeper. Kepa tried palming the ball however misjudged and it went into the net. Spurs 1-0. Another goal it was for Alli against Chelsea. The England man got his sixth goal in five games against the Blues. Shortly after in the 10th minute, Son had an opportunity to make it two however he smashed it over after getting a clear cut chance via Eriksen. Chelsea needed to show something. In the 14th minute, Eden Hazard got into the penalty area after Kante won the ball back for the Blues, then the Belgian went down thanks to a kick from behind by Spurs’ Foyth. Referee Martin Atkinson waved away any appeals. It was starting to look like one of them days for Chelsea. In the 16th minute Harry Kane doubled Tottenham’s lead. From 25 yards out Kane struck a shot which simply went into the back of the net. It was as simple as that. David Luiz seemed to step out of the way of Kane’s shot, whose effort confused Kepa as the sweet enough strike hit the back of the net. There was certainly some communication missed by the Blues, it was just too easy for Spurs to get their second goal of the game. Chelsea started to look ragged already as Rudiger gained a yellow card for bringing down Kane in the 19th minute. Sissoko was proving to be one of Spurs’s best players in the first half as he won a perfectly timed sliding challenge when Kovacic was heading towards the home side’s goal in the 33rd minute. In the 38th minute Hazard had a strong effort pushed away by Lloris as the winger won the ball back for the Blues in midfield, working his way just outside the area and taking a shot. Chelsea looked frustrated as Jorginho was lucky not to get a yellow at this point after harshly tackling Kane and not winning the ball. Hazard got shown a card deep into added time before half-time as he looked to have pushed Davies in the back of the head trying to get to a cross. Half time came as an unimpressed Maurizio Sarri headed down the Wembley tunnel, thinking how he could get his Chelsea team to turn this one around. It certainly weren’t looking good and the Blues needed to show a plan B. Was there one? Chelsea started off well enough as the visitors clung onto possession. Tottenham were sitting back ever so slightly as Willians cross came to Morata who shot it way above the bar in the 48th minute. However, it would be Spurs who scored again to make it 3-0 in the 54th minute. The hosts counter attacked as Alli passed to Son near the halfway line. Son was up against Jorginho on Chelsea’s left side who isn’t exactly a pace merchant. Son beat the Italian midfielder in a race and cut inside Luiz to score the goal which would confirm Chelsea’s first loss in the Premier League this year. Barkley and Pedro entered the frame on the 58th minute for Kovacic and Morata. The English Barkley nearly made an impact as he sent an almost prefect cross for Kante to head just over the Spurs’ bar in the 64th minute. Spurs however blazed a couple of chances over soon after and could’ve easily made it five by the 70th. Jorginho went into the referee’s book eventually as he raked his studs down Alli’s leg in the 72nd minute. Willian then made way for Olivier Giroud in the 76th minute. The French international was looking for his first Chelsea goal this season and got it as Azpilicueta’s cross from the left was met by the rising head of Giroud for a Chelsea consolation, 3-1. Not long after in the 88th, Pedro nearly got Chelsea fans going as his unexpectedly met half-volley flew just over Hugo Lloris’s bar. The final whistle came as Chelsea were pitiful on the day, marking their first loss of the campaign at Wembley. It was a real shame the game went this way as Tottenham pretty much took the game to the Blues. Shambolic defending from the Blues adding to Spurs gambling of attacks paid off for the hosts in the end. Maurizio Sarri and his Chelsea team need to re-address the ongoing defensive issue, firstly with a Europa League tie against PAOK. Then it’ll be time to face a rejuvenated Claudio Ranieri Fulham side who will be looking to steal three points from Stamford Bridge in the first West London derby of the season next Sunday.